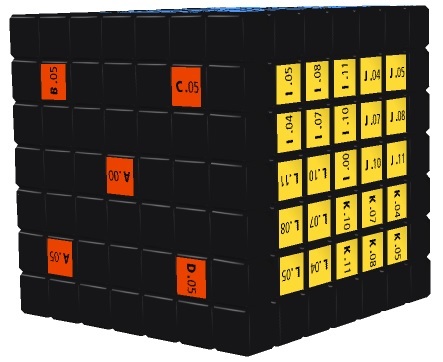 In this webpage, I will show how to solve odd-order Supercubes. The solution procedure will be divided into 7 steps with some steps subdivided into sub-steps. 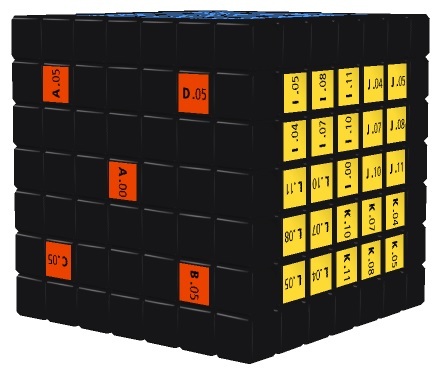 If you are trying to solve a 3rd-order Supercube, then you may jump straight to Step VI. Otherwise, please start from Step I below. In the first step, you try to match the center pieces on any 4 faces, i.e. move the non-core center pieces to the correct positions relative to the core center pieces. Although you can freely choose any 4 faces in this step, to facilitate the following discussion, I assume that these 4 faces are the white, orange, blue and green faces. The method for accomplishing this step is basically the same as that for matching the center pieces on the first 4 faces of a Rubik's Cube, and I assume you already know how to do it. If you don't, please watch this video before you continue reading. Please note that there is not a fixed algorithm for this step and so you must figure this part out for yourself, before you can proceed to the next step. In the figure above, the red "03" orbit contains 4 center pieces labelled "A.03", "B.03", "C.03" and "D.03". Without these labels, we will have a Rubik's Cube and we can swop the positions of these 4 center pieces among themselves. 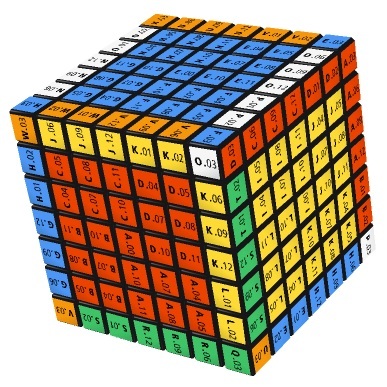 But when solving the Supercube, you cannot mess up the positions of these center pieces. 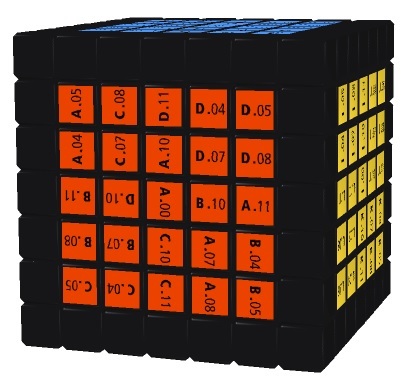 This is why we say that solving a Supercube is harder than solving a Rubik's Cube. 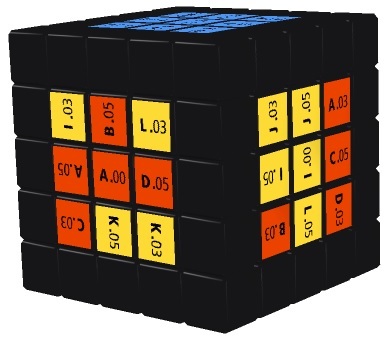 But despite this complication, this step of solving the Supercube does not require new skills or new formulas other than those required for solving the Rubik's Cube. The conditions and examples of use of these two formulas are given in TUTORIAL ON SUPERCUBE SOLVING (1): Basic Notions. Note that when doing this step, if you find that some yellow center pieces are located at wrong positions on the yellow face, you may need to move these yellow pieces to the red face first, and then move these yellow pieces back to the correct positions on the yellow face. In the figure above, although all red center pieces are now located on the red face, not all of them are at the correct positions. In this step, we will use the (XYZ) Formulas to move the red pieces from their incorrect positions to correct posistions. But before doing this, we must check whether each orbit of the non-core center pieces on the red face has an even relative parity (to be defined below). This is because the (XYZ) Formulas can only take the desirable effect on orbits with an even relative parity. Thus, to accomplish this step, you need to go through the following three sub-steps. For Supercubes, we can define two notions of parity: absolute parity and relative parity. Since the definitions are quite technical, I will not go into the details. But fortunately, for the purpose of Step III, there is an easy way to define the relative parity of each orbit of non-core center pieces on the red face. You first list the 4 alphabets ("A", "B", "C" and "D") that appear in each orbit in clockwise direction, with the alphabet that appears on the top right hand side of the string ".00" in the core center piece being listed first. Note that here "top right hand side" is relative to the string ".00". Under different orientations of the core center piece, "top right hand side" may mean differently. After listing the alphabets, you then determine how many transpositions you need to make in order to transform this list to "ABCD". By "transposition" I mean interchanging the positions of any two alphabets. If the number of transpositions is an even number, the relative parity is even, otherwise it is odd. If all orbits have even parities, you can then jump to Sub-step 3. Otherwise, you proceed to Sub-step 2. The table shows that the "10" and "11" orbits both have odd relative parities. Therefore, you need to go through Sub-step 2. Fact 1: The relative parity of each point piece orbit is always even. Fact 2: The orbits of paired pieces that are matched up with each other have the same relative parity. Thanks to these two facts, the checking process in this sub-step can now be greatly simplified. First, you do not need to check the relative parities of the point piece orbits. Second, for each pair of paired piece orbits that are matched up with each other, you only need to check the relative parity of one orbit from among the pair. 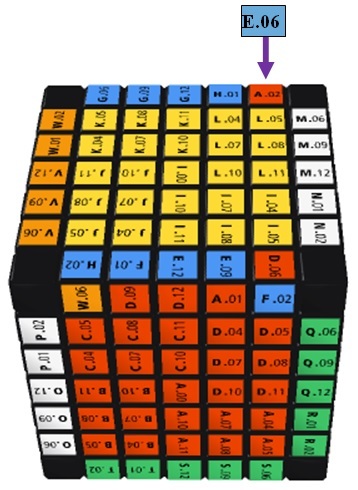 For example, for the 7th-order Supercube shown above, you only need to check the relative parities of the "11", "10" and "08" (or "04") orbits. The subscripted variable x represents the non-core inner layer that you need to apply this formula to. Note that by just focusing on the focused piece orbits as described above, you will automatically take care of all non-core center piece orbits, i.e. you will ensure that all non-core center piece orbits have even relative parities. You may now verify that all orbits of non-core center pieces in the Supercube above have even relative parities. 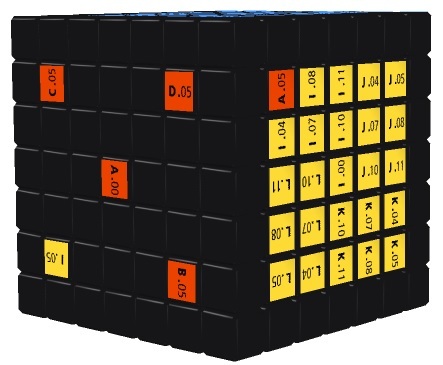 In the figure above, the alphabet list of the "05" orbit has been restored to "ABCD" and the "I.05" piece has also been returned to the yellow face. By following the above procedures, you will be able to restore all orbits of non-core center pieces on the red face to normal and finally complete this sub-step as well as Step III. In this step, you try to match the edge pieces on any 10 edges of your choice, i.e. move the non-core edge pieces to the correct positions relative to the core edge pieces. Just like Step I, the method for accomplishing this step is basically the same as that for matching the edge pieces on the first 10 edges of a Rubik's Cube, and I assume you already know how to do it. If you don't, please watch this video before you continue reading. Note that there is not a fixed algorithm for this step and so you must figure this part out for yourself, before you can proceed to the next step. 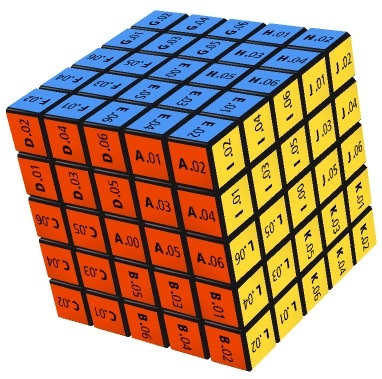 To match the edge pieces on the front-top and back-top edges of the Supercube shown above, you may first substitute 1 into the variable x and use the One Side Flipping Formula (5). This will flip and swap the "W.06-H.02" and "F.02-D.06" edge pieces. You then substitute 1 into the variable x and use the One Side Swapping Formula (3). This will swap the "E.06-A.02" and "W.06-H.02" edge pieces and thus yield the desired result. Some readers may worry that by using formulas (3) - (7), you may screw up the centers that have been matched in the previous steps. But please rest assured that this will not be the case. As a matter of fact, formulas (4), (6) and (7) will not screw up any center (try and see). Although formulas (3) and (5) will screw up the top center, if you use them one after the other on the same non-core inner layer, the net effect is that the top center will not get screwed up (try and see). 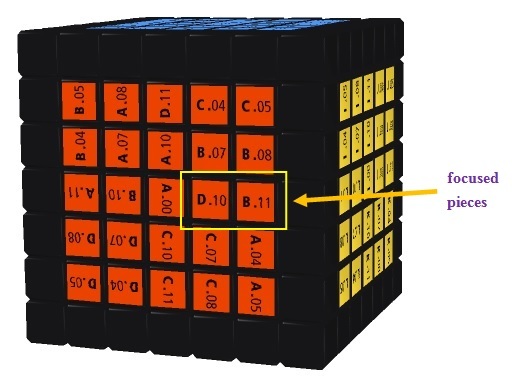 And when solving an odd-order Supercube, it will always be the case that formulas (3) and (5) are used one after the other on the same non-core inner layer. 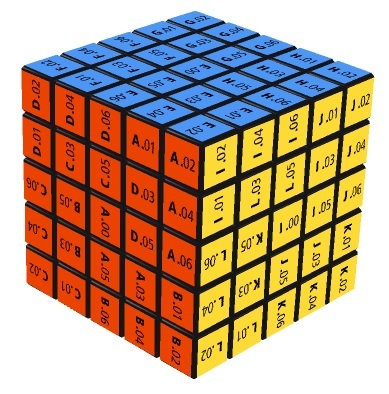 If you view the edge pieces on each edge as a whole and the center pieces in each center as a whole, then the Supercube above is no different from a 3rd-order Supercube. 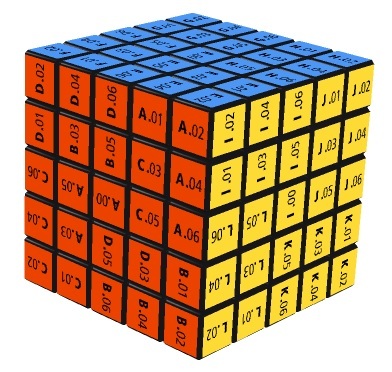 Therefore, you can use the same method of solving a 3rd-order Rubik's Cube to solve the corners and edges of the Supercube. I assume that you already know how to do this. If you don't, please consult 7 Steps Solution Guide. Note that when doing this step, you do not have to worry about the orientation of the centers, because this will be taken care of in the next step. Just forget the symbols on the center pieces for the time being. The effects of these formulas are given in TUTORIAL ON SUPERCUBE SOLVING (1): Basic Notions. Note that by using the formulas shown above appropriately, you will be able to handle all possible situations. The figure above shows that the yellow center is now oriented correctly while the red center deviates from the correct orientation by 180°. You should then rotate the whole Supercube so that the red face faces upward. Then use the One Center Rotation Formula (9). After that, the red center will also be oriented correctly.